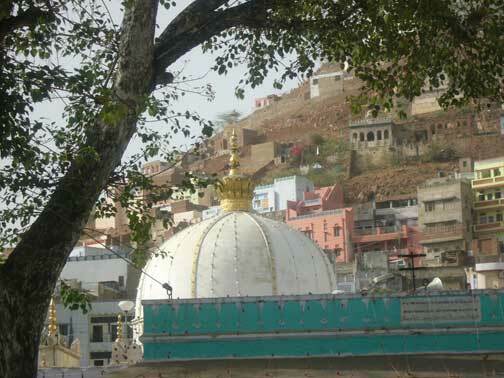 "Hazrath Khwaja Garib Nawaz, Ajmer Sharif -Rajasthan, INDIA"
Hazrat Khawaja Moinuddin Hasan Chisti (R.A.) popularly known as Hazrat Khwaja Gharib Nawaz (R.A.) was born in 1142 A.D. in Sijistan (Iran). His paternal genealogy is related to Hazrat Imam Hussain (A.S.) and that of his maternal to Hazrat Imam Hassan (A.S.) and thus he was a direct descendant of Prophet Hazrat Mohammad (S.A.W.). He is a wealth bestowing Saint in this world and hereafter and an embodiment of divine light. A complete spiritual guide for the imperfect disciples and a leader of the perfect Saints. Ajmer was not merely the seat of Chauhan power ; it was a religious center also where thousands of pilgrims assembled from far and near Shaikh Mu’in-u’d-din’s determination to work out the principles of Islamic mysticism at a place of such political and religious significance shows great self-confidence. Gharib Nawaz loved humanity in general and the Indians in particular. Indeed he had a mission to bring a social and spiritual revolution.